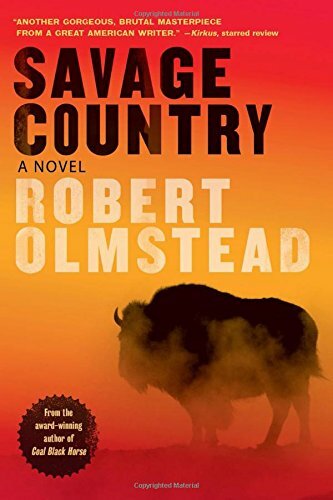 With the publication of Savage Country by Robert Olmstead, Algonquin Books adds to its reputation as a publisher of exceptional Western-themed historical novels. Her brother-in-law, Michael, arrives in Kansas and pays off David’s debt to Whitechurch, but reveals his horde of twenty dollar gold pieces at the same time. Whitechurch sends his “hard boys,” teenaged boys in his pay and anxious to kill, to hunt down Michael. The former Confederate soldier and African adventurer expects that Whitechurch will not be able to resist robbery and murder if it gains him Michael’s remaining coins. A blast from Michael’s shotgun puts paid to Whitechurch’s plan. But Michael knows that a man as greedy and tenacious as Whitechurch will not give up. Mr. Olmstead’s description of the guests at David’s funeral eloquently reflects the diverse people who inhabit frontier Kansas and the West for that matter. In fact, in a single, simply written paragraph Mr. Olmstead’s sums up the hopes, the struggles, the defeats, the histories, of Western pioneers. Ex-soldiers dressed in the remains of Union uniforms, for David, unlike Michael, had been a Union officer, paying homage to a good and generous man. Elizabeth, facing poverty with nowhere to go, and limited opportunity to support herself, is frightened and still angry. Yes, David was a good man, but he was also a foolish man. Some of her fate is her own fault. She accepted what David provided without questioning its source. However angry and grieved Elizabeth is, she is also a proud and determined woman. She survived three years as a nurse during the Civil War; if she survived the horror of that experience, she can overcome the adversity facing her now. She will follow David’s vision to earn her way out of debt and survive, and all her workers who depend on her will survive. She and her men will go south, beyond the Deadline that marks the boundary between Kansas and the land of the Comanches. She will hunt the buffalo, and the sale of their hides will allow her to pay her debts and to survive. All of Michael’s arguments against the buffalo hunt don’t deter Elizabeth, and he capitulates. Elizabeth is now his only family. “She’d have her excursion south. She’d get a taste of the bloody business. He hopes it will make her turn back. In gritty, realistic detail Olmstead portrays the “bloody business” of a buffalo hunt. His meticulous narrative of the supplies needed, from the Sharps Big Fifty, to arsenic, to flour, sugar, coffee, ropes, and large wagons pulled by yokes of oxen, to the technique used to butcher the buffalo and preserve the hides, Savage Country is a textbook description of how the buffalo was hunted nearly to extinction but without the hand-wringing angst of many writers. Savage Country is a story of survival, a story of what people are prepared to do to survive. The West of 1873 is harsh and unforgiving, and a merciless natural environment. Olmstead describes the rattlesnakes, the blizzards, the hungry wolves and coyotes that follow the hunt to feast on the remains of the buffalo, Indians depredations, the danger of rabid animal bites, and the bloody, monotonous butchering. From Michael and Elizabeth, to the Reverend Doctor Purefoy who insists on accompanying Elizabeth on the hunt, to a diverse group men, some loyal and good, others little better than thugs, the characters of three dimensional, complex, and capable of both violence and cruel mercy. Savage Country by Robert Olmstead is a literary achievement that describes the West and those who struggled to survive in its harsh environment. It is not for fans seeking a romantic view of the West, nor for those wanting a tradition shoot-um-up. Savage Country is for the serious reader.